Neither of the two of them could tell me their teachers' names. However, one was able to tell me EXACTLY the candy she got as a treat from the teacher after class, and the other could only remember that the teacher said "1-2-3 Look at me" to get their attention. Lastly, while watching the Olympics they told me that they got to see some of the Olympics at after-school care. One said they saw 'water basketball' while the other reported it was 'water soccer'. I repeatedly said, "You mean water polo?" But, nope I'm apparently "Crazy Aunt Hope," because there is absolutely no such thing as Water Polo!! Are you neurotic or have any neurotic tendencies? This site will let you share and compare those. I, personally, have waaaaaytoo many to list. We're not going there. 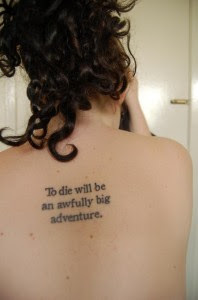 The idea of literary tattoos is compelling. I've always contemplated a tattoo and these (from books) really appeal to me. I love the written word. Of course, picking just one quote, just one book, just one author would be so VERY hard for me. Yet, definitely something to consider. 30 coolest and creepeiest trees on earth. Font Conference (a meeting of the fonts). I LOVE fonts and this just makes me happy Yet, all of them did not live up to the look of their font - more to the name of them. It 's still a neat little video. The greatest game shows ( You need to know that I LOVE games shows.) This list is fairly concise. However, I have a problem with shows like survivor and the amazing race on there as there's no studio audience or anything. I especially have a problem with those being rated higher than shows like Family Feud, The Newlywed Game, and Let's Make a Deal. In any case, if you love game shows - it's worth look over. Go on and do something wild.